The Wolves held up their helmets in victory as they remained undefeated last Friday with a 30-8 win over Rochester Adams. 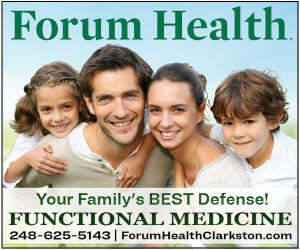 “This is a big win,” Kurt Richardson, long-time head coach for Clarkston Varsity Football, told the boys after the game. 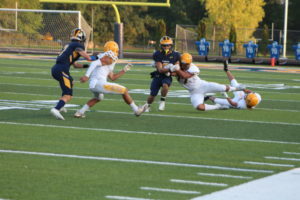 Clarkston opened with possession on the 20-yard line and controlled the ball, not letting go of possession until Jake Billette scored one a 3-yard touchdown with 3:50 remaining in the first quarter. A minute later Wolf Clayton Hall got the ball back, recovering Adams’ fumble, putting Clarkston on the 48-yard line. It led to a 14-yard touchdown pass from Jake Jensen to Matt Miller, made less than two minutes into the second quarter. With 31.4 seconds remaining in the first half, Aaron Berti recovered a fumble by the Highlanders. With three seconds remaining, Tristan Mattson kicked a 43-yard field goal to put the score, 16-0. “Tristan was good again tonight with special teams,” Richardson said. The Highlanders opened the second half with a 3-yard touchdown by Carter Farris and a 2-point conversion to close the gap. The Wolves came back to score twice in the last stanza with a 1-yard touchdown by Jensen with 11:55 left in the game and a 7-yard touchdown by Jacob Honstetter less than three minutes later. For offense, Jensen was 7-for-15 in passing for 74 yards. Billette rushed the ball 20 times for 93 yards and Honstetter carried the ball 14 times for 123 yards. Mattson was 3-for-3 on PATs with one field goal. For defense, Keagan King had five tackles and three assists. Honstetter had four tackles and two assists. Chase Lajiness had four tackles, one assist and one interception. Max Nicklin, Brendan Barker and Josh Crull each had three tackles. Barker had one interception. As Clarkston prepares for their next games, Richardson added he would like to see penalties cleaned up. “We had too many penalties,” he said about the game against the Highlanders. The Wolves (4-0, 2-0 OAA Red) head to Southfield Arts & Technology (2-2, 1-1) this Friday. Kickoff is at 7 p.m.